So just how relevant or valuable IS an American farmer like Joel Salatin coming to Australia to talk small farm skills and enterprise planning? As it turns out, quite a lot. The techniques + thinking of Polyface Farms’ founder has influenced many amazing small farm enterprises in Australia that we know of, helping them to thrive, and feed their communities with good clean food in the process. 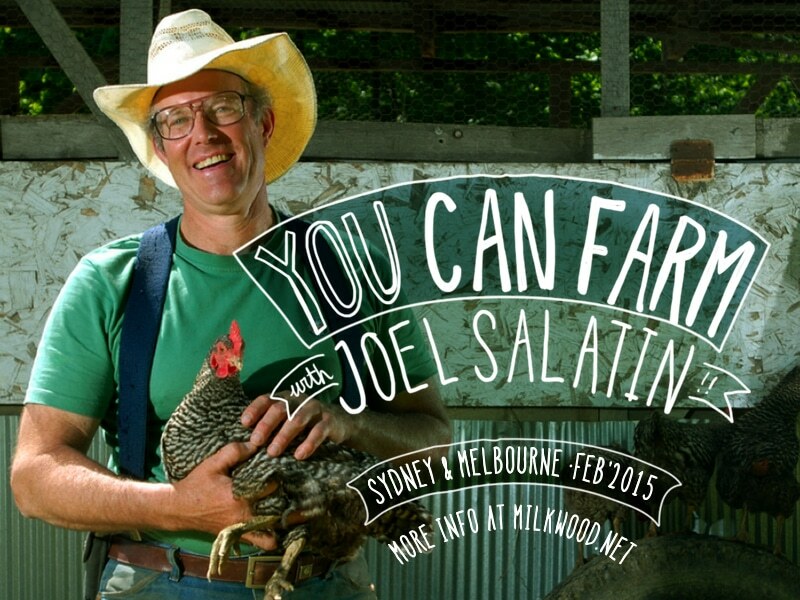 In February, Joel Salatin will visit Australia for the 6th time to talk turkey. And chickens. And cows, and interns, and on-farm processing, and integrated market gardening, and pigs, and many other things besides. Over the years that Joel’s been coming to our shores, we’ve seen Joel effect, activate and inspire folks of every scale, ever landscape, and every budget, to either get farming or get more involved in their food system. Of course, this is not a magic bullet situation – far from it. All the folks we’re talking about here were already motivated and determined to make farming clean food their livelihoods. And many of them were already doing it – with skill and with passion. In some cases, I think it was a case of editing existing growing systems, farm designs or enterprises. For others, it was the activation they needed to explode out of passive land ownership into the amazing, challenging and rewarding life’s work that is a small farm enterprise based on ethics, clean food and a regenerative landscape + economy. 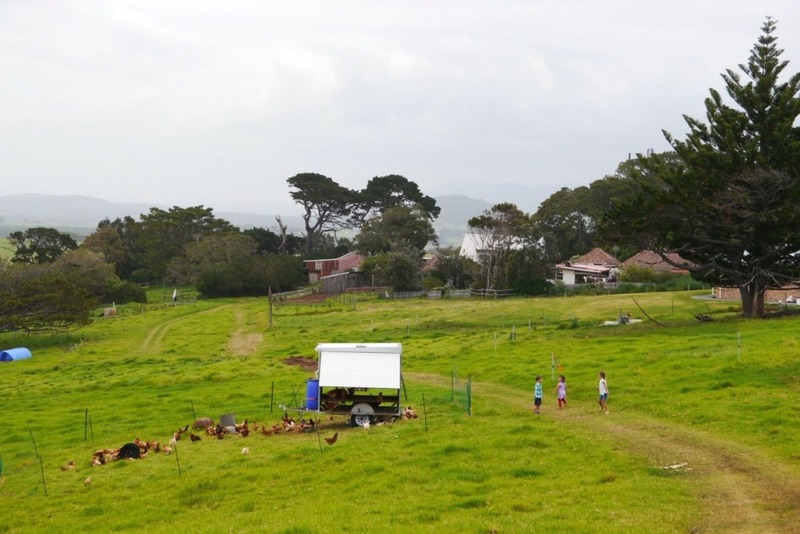 Fiona + Adam Weir-Walmsley returned to Fiona’s family farm in Gerringong NSW a few years ago, with a resolution to start a small mixed-enterprise farm providing clean food (and cooking skills) to their community. Attending a workshop with Joel Salatin in 2012 had a major effect on the direction of their enterprise, and a recent chat with Joel helped with nutting out some issues with their layers + also meat birds. “I read an article by Joel at a stage where we had moved back to the family farm but were still undecided about what or how we wanted to farm. Joel planted a seed in our mind about the possibilities of diversified farming on a small area, farming in a way that had the potential to provide a living and improve the land we lived on. “small family farm producing chickens and Muscovy ducks on 120 acres of beautiful farmland near Balingup in the Southwest of Western Australia. Our animals are hand-reared on perennial pastures, insects and sunshine. The way they are supposed to be. Citing Joel Salatin + Polyface Farms as their initial inspiration, these folks have a knack for finding just the right bits to make their enterprise sing (including a micro-abattoir AND a duck plucking machine…). “At Southampton Homestead and Farm, applying the Polyface methodology has led Michelle and I to build WA’s only pasture-raised chicken operation, establishing buying clubs, dealing directly with our customers, with the icing on the cake being our on-farm micro-abattoir. Joyce Wilkie + Michael Plane established Allsun Farm in Gundaroo over 25 years ago as a ‘garden farm’ focussed on organic vegetables + pastured eggs, with side products including ducks, broiler chickens, pigs and other seasonal extras. Their friendship with Joel goes way back, and each has hung out at the other’s farm multiple times – there’s a great video here of a kitchen chat between these two crews. “Farming is never about dogma – it is always about taking the things we know deeply, the knowledge infused from our parents and early teachers, the books we read and the people we meet, and using all that, and our own creative abilities, to make the best possible use of our land, our climate and our abilities. Ben Falloon runs Taranaki Farm at Woodend with his two daughters and seasonal interns. He’s implemented many systems based on Polyface Farms’ influence, including forested pigs, egg mobiles, holistically managed cattle and broiler chicken tractors. 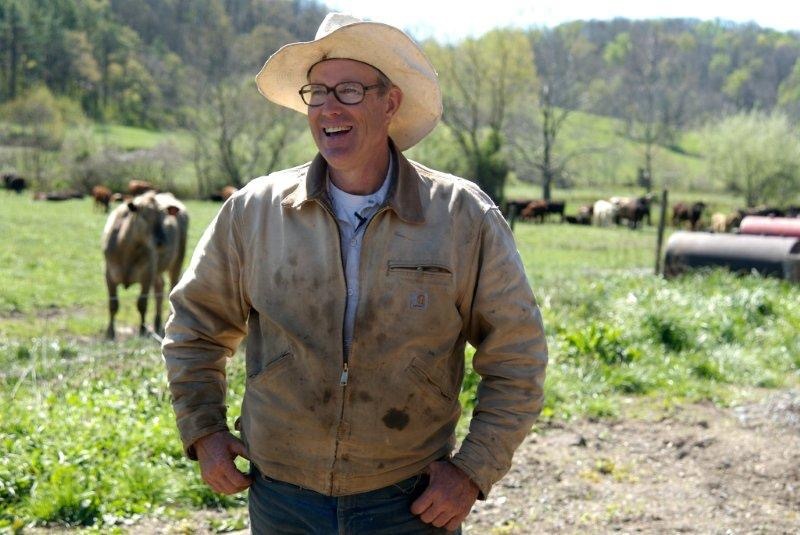 “What Joel Salatin inspires is HOPE – for both farmers and local communities. His tireless work and educational advocacy toward a farmer’s right to earn a respectable living is profound. Beyond developing Taranaki Farm using Keyline principles, we’ve been hard at work adapting Joel’s farming methods to the local context, implementing classic Polyface enterprises here in Victoria, Australia. Devised as a Community Supported Agriculture project that also boasts on-farm cafe, education, agritourism and a food-based enterprise hub, The Farm is a larger scale project to many of the family-scale examples above. However, speaking with Will Cotteril, the farm’s general manager, revealed that Joel’s influence is alive and well in a farm project – The Farm hopes to create holon enterprises (independant businesses that share central resources that would be inaccessible to a small enterprise) along Polyface lines. “The one thing about Joel and his approach to farming that has left the biggest impression on me, has been his constant ability to challenge the norm. So many farmers do what they do because that’s the way it’s always been done but Joel makes us stop this repetitive cycle and look outside the square. Whether it be his actual farming methodology or how he is multi-stacking businesses under his Polyface umbrella, he is always looking at ways to improve what he and more importantly, others do. What sets Joel apart from so many others is the fact that he is walking the walk while he is talking the talk. Very often we confronted by teachers that know their stuff but have never successfully put it into practice. Joel has done it. What’s more, he’s still doing it. And of course, there’s many, many more Aussie farms that have been influenced in spired in ways both big and small, by Polyface Farms. It’s good stuff, people. So there you go – not bad for one guy in a hat (representing the amazing and enduring team of family + crew that have created Polyface Farm, of course). And we rekon there’s plenty more that Joel has to give. We’re also sorting out some webinars with Joel while he’s in Aus which will drive to the heart of specific enterprises – things like pastured chickens, pastured pigs, and setting up an enterprise on rented land. Make sure you’re on our mailing list to hear about those once they’re live. Or, if you’re in Queensland, never fear! 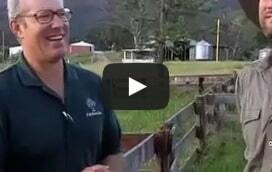 Our mates at RegenAG have a full program of Joel Salatin workshops etc for you to join in. We hope to see you there! Please tell your friends and community and help us get the word out? It’s going to be awesome. Dark Emu is not a large book, but it packs a punch well above its . . It's mid summer here at Melliodora. The days are hot and the cica . .
Its great to see these things taking off. More power to the people who supply healthy food. We have begun duplicating the Polyface farm model in Tasmania, starting with extremely little money, and leasing unused land, laying out one enterprise a year. Beginning with forest foraging pork in 2013, we tightened the system with all portable feed systems and now having added and begun pasture raised meat chickens (2014) and are spending time again on building up the portable system, before we add on and launch the next enterprise of pastured egg layers (2015). We are looking forward to offering workshops in constructing portable chicken shelters in the near future. After reading ‘You Can Farm’ in 2007, we were hooked! We have made every effort to see Joel speak upon his visits Australia, until finally, Derek became the first Aussie intern at Polyface in 2012. The experience was invaluable! It has provided us with a reliable and knowing foundation behind analysis and calculation of grass days per acre for moving livestock, rotating sequences and building portable animal shelter systems. We are so excited seeing our chickens happy and expressing their ‘chickeness,’ and providing for their needs in such a workable system has made us acutely aware of the need for this model to be taught and duplicated everywhere! It creates a viable farming opportunity for numerous farmers without the huge loans and outlay (especially those like us desiring to begin farming, without inheriting a farm!!) No chicken will taste better! We can’t believe the taste memory of how chicken used to taste coming back after our first few mouthfuls!!! Would love to connect with the people from Field and Forest farm in Tassie to talk about their setting up of their enterprise . My husband and I are landless farmers, working for other people . We are now very keen to jump off and start our own enterprises . Is it possible to get get contact details ? Joel has greatly influenced my partner and i as well. We have a small farm at Yass (near Canberra) and are using Joel’s rotational grazing methods for our Wiltshire Horn and Dexter’s. We aer already noticing an improvement in our pastures which where once overgrazed significantly. Unfortunately we both have to work full time as we grow the farm but we too hope to be in a position to farm the land full time one day. We hope to add more layers to our rotational grazing progress in the coming years. We saw Joel a few years ago at Mulloon Creek and while some of his teachings are not quite applicable to Australia the fast majority are. My wife and I saw Joel through RegenAG a few years ago. He has influenced us greatly and I refer to his books regularly. We have a 200acre farm just out of Kyogle in Northern NSW, we have cattle, free range pigs, layer hens, meat chicken & rabbits. On farm we have our own butchery and make smallgoods that we sell around the northern rivers.We hope to have an on-farm small scale processing room for our rabbits and chicken very soon to complete the paddock to plate polyface concept. The more people that see, hear and understand what Joel is doing, the better our environment ,health & local communities will become. hi greg – care to expand on that?